According to the mayor’s office, New York City’s tourism has had eight consecutive years of “record-breaking tourism” — with over 62.8 million visitors last year, an increase of 2.3 million more visitors over the year before. This incredible growth requires more places for tourists to stay. We curated a list of the top 10 most exciting new hotels opening (or set to open in the very near future) around the city. From a super cool modular hotel to a hotel that defines itself as an “experience in essentialism,” we have got it all! Just in time for the holiday season, here are some new hotels to book ASAP! Moxy NYC Downtown promises to be the Financial District’s go-to spot for thrills and delight. There will be a “monster-sized” virtual LED wall and a 5,000 square foot adult play space. Catering tot he younger crowd, there will be music, arcade games, cocktails, and elevated bar bites. The stylish rooms will have super-comfy beds, hanging chairs, 50” TVs, B&O surround sound and automated lighting & shade control. 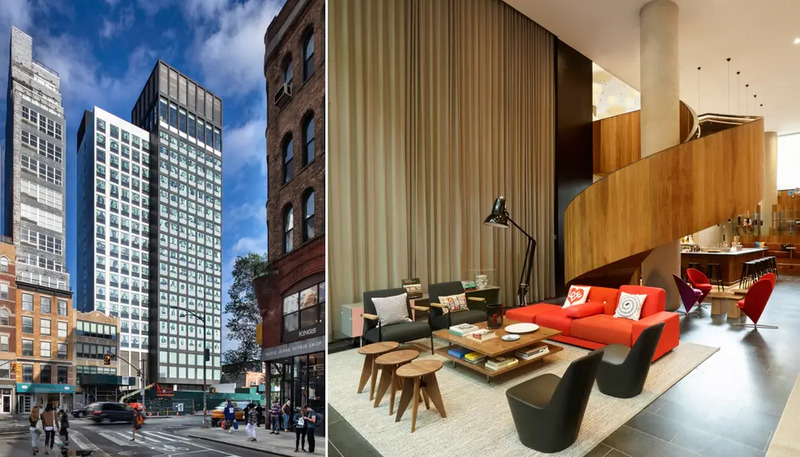 Just opened, the 19-story citizenM Bowery is the tallest modular hotel in the country. Designed by Stephen B. Jacobs Group, the modules were built in Poland, packed and then shipped to New York. 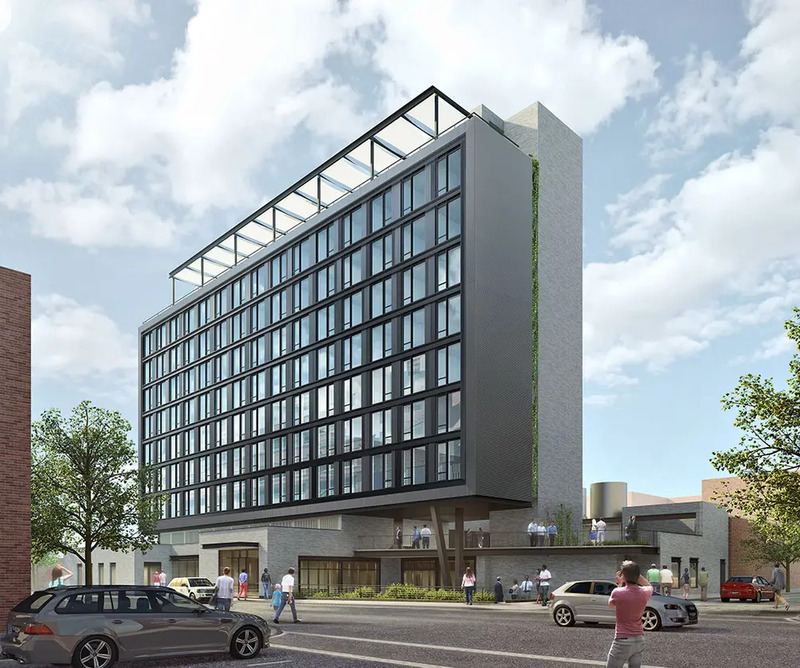 According to their website, the hotel will “breathe contemporary style with affordable luxury like no other in downtown.” The hotel boasts 1-minute check-in, free wifi always, 24-hour food and drinks, and no cost for movies in their 300 stylish rooms. The hotel has 210 guestroom modules and 90 non-modules, for a total of 300 rooms. The hotel also includes a double height lobby and lounge, a rooftop bar with outdoor space and spectacular panoramic skyline views, a bistro-style restaurant and coworking space on the ground level, and a 4,000-square-foot plaza. 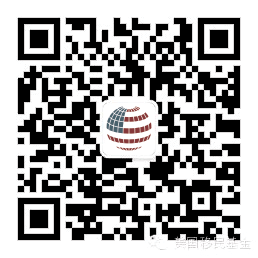 The property is currently open w, and in the coming weeks, all of the rooms will be open (as per two weeks ago, about 50% of the rooms were available). Sister City, a new spin-off hotel (or “experience in essentialism,” as their website states) from Ace Hotels is opening in February 2018 on the hip Bowery. The hotel, which was inspired by “the functional perfection of Finnish saunas, Japanese bento boxes, rock-cut cliff dwellings of prehistory and John Cage’s 4’33” will be something to experience, for sure. 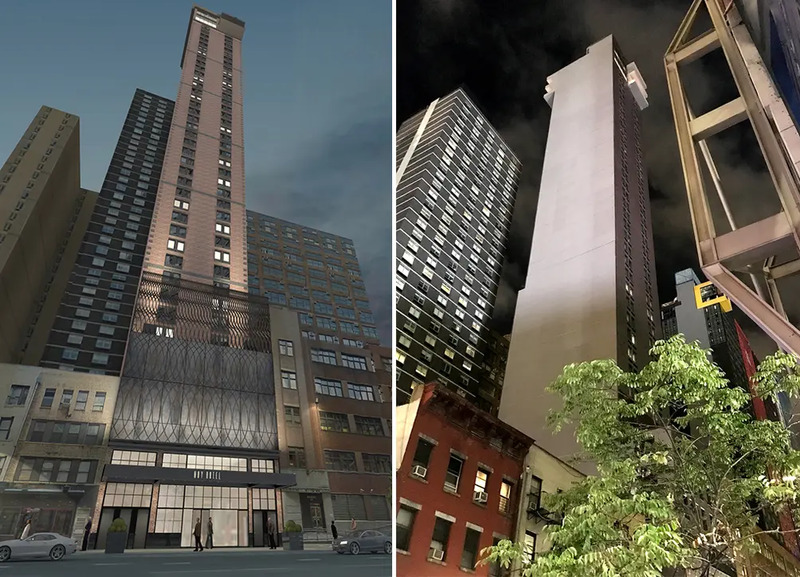 The hotel will offer 200 efficient rooms, a ground-floor restaurant with an inventive menu by chef Joe Ogrondek called Floret and a rooftop bar. The hotel is due to open in late 2018 with its hostel-like accommodations set to compete with Airbnb. 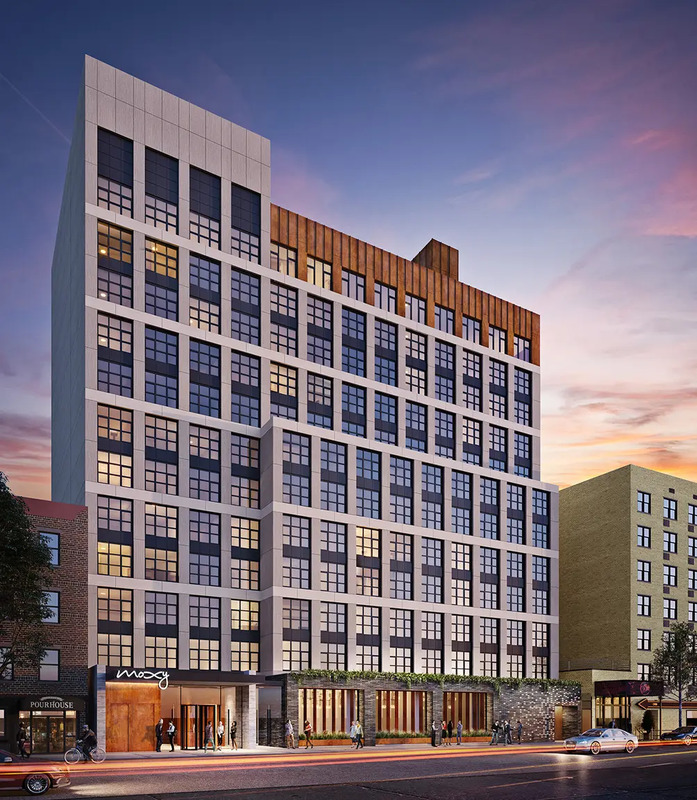 The third of four Moxy hotels that Lightstone is developing in New York City in partnership with Marriott, will be a 285 room, 13 story hotel on the corner of Bowery and Broome. 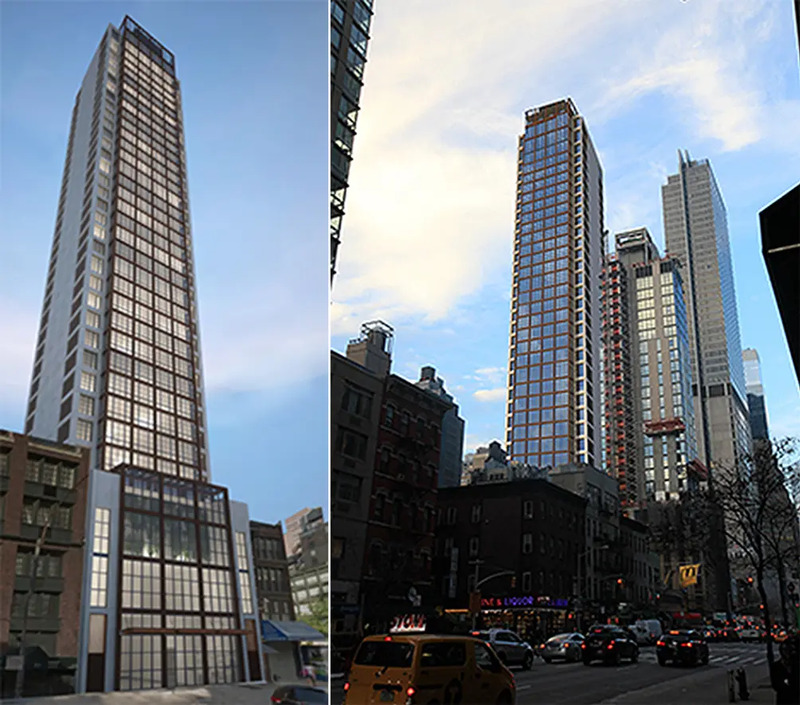 Construction has already topped out and the Moxy East Village is expected to open in the fall of 2019. At 37-stories tall, the Moxy Chelsea embraces its Flower District neighborhood by blending a botanically-inspired design with Italian romance. 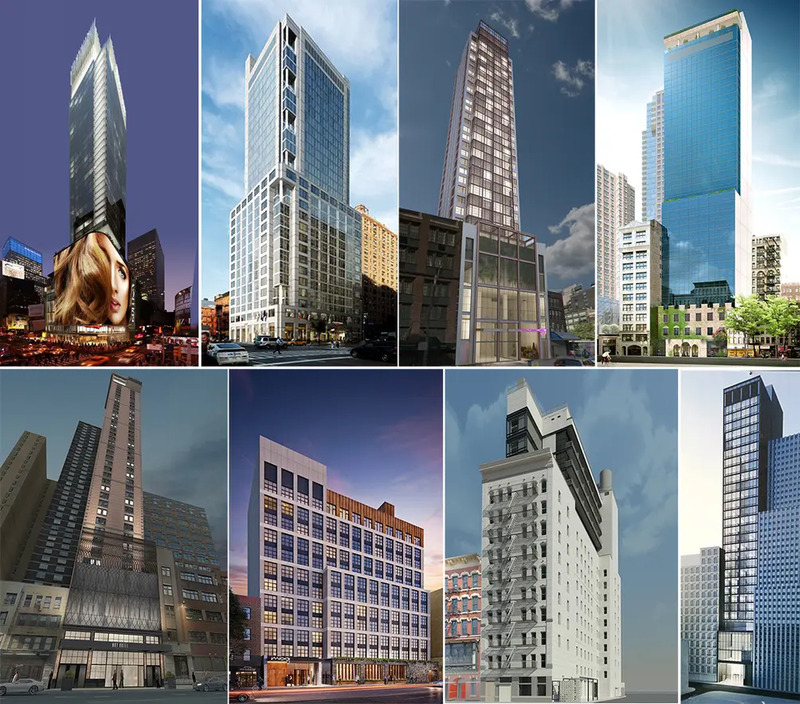 The 37 story hotel will feature four new dining and drinking concepts by TAO Group and Francesco Panella and there will be a spectacular glass-enclosed rooftop lounge that transforms into an alfresco veranda, a caffè, ristorante, and a cocktail bar. There will also be a coworking lounge that serves gourmet Italian street food. Also planned are DJ appearances, a made-for-Moxy bocce drinking game on the terrace, rooftop ﬁtness, meditation, reiki classes, ﬂoral workshops, and pizza-making classes, and more. 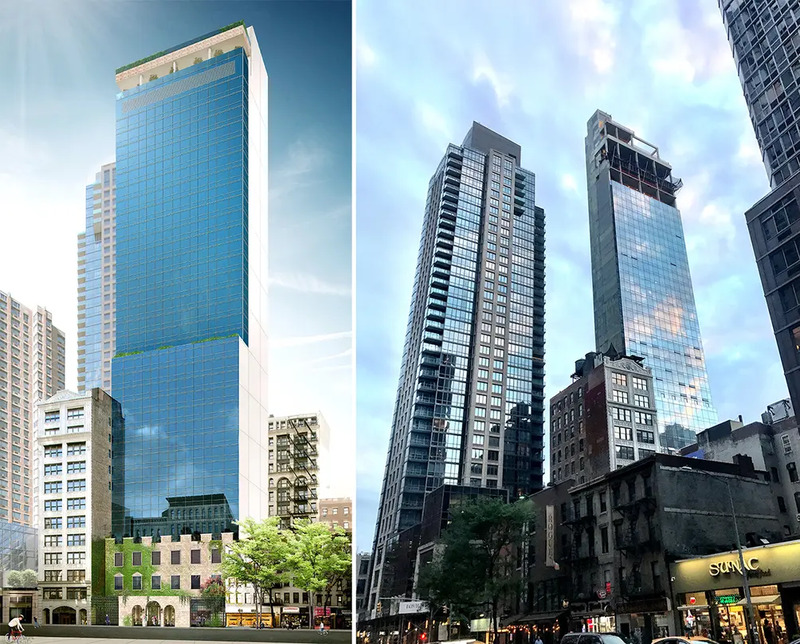 This will be NYC’s first TownePlace Suites brand extended-stay hotel. 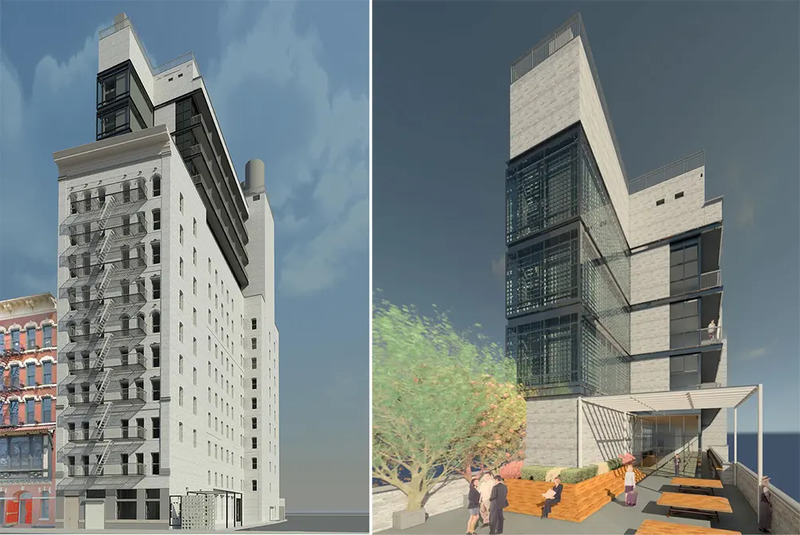 The boutique-style hotel’s 114 “studio-style” rooms will include kitchenettes, private terraces, a rooftop patio with Weber grills, a fitness center, and a landscaped courtyard. The 452 guest room Times Square EDITION has four levels of public space including a 5,000 square foot performance venue, a 1,900 square foot studio, state-of-the-art fitness center and a lobby lounge at check-in level. The hotel also has multiple food and beverage outlets including a restaurant with a massive, nearly 6,000 square foot beer garden and event deck overlooking Times Square. 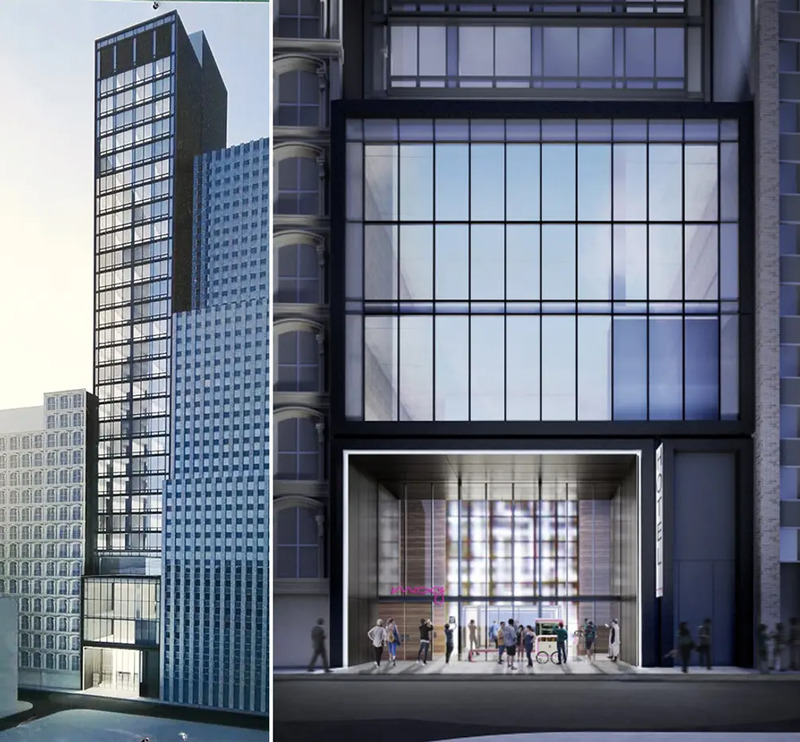 The new Marriott Edition Times Square will be a 312-foot-tall, 399 guestroom hotel in the new blossoming Hudson Yards neighborhood. The new state-of-the-art lobby is centered on The Bistro which will offer food from morning until night. The hotel also offers flexible spaces to work or relax, free Wi-Fi throughout and access to the latest news, weather and airport conditions via our GoBoard technology. There is also a fitness center, indoor pool and whirlpool. Centrally located near the “Crossroads of the World”, Aliz is one of the tallest hotels in New York and brings 287 guest rooms across its 42 floors. Guests will be treated with a two-story rooftop bar and lounge, stylish restaurant and lounge spaces, and luxury amenities. The bar will be one of the tallest in New York ity and boast views of city skyline and many of its iconic landmarks. Located on the site of the former Rosenwach Water Tower factory in Williamsburg, Brooklyn. This chic hotel features stylish, industrial-chic rooms with brass and concrete details and is one block from East River State Park, a 6-minute walk from the Bedford Av subway stop and 5 miles from the Brooklyn Bridge. An old brick carriage house is incorporated into the building which features interiors by Ennismore Design Studio. The Hoxton has three bars and restaurants including one with private dining and another that has a rooftop terrace with views across Manhattan. The 175 guest rooms fall into three categories: Cosy, Cosy with a View, and Roomy. The hotel decorated the rooms with locally made ceramics, books curated by local residents and bespoke linens by Dusen Dusen.